Clean-up crews are working day and night to remove 100,000 gallons of oil that fouled a stretch of California coastline after a pipeline ruptured Tuesday. 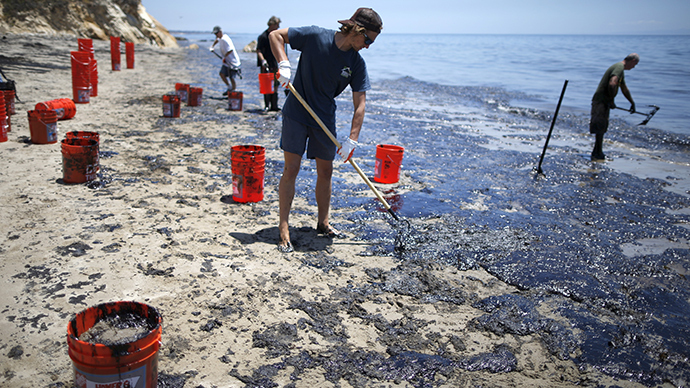 It is the biggest oil spill in the Santa Barbara area since 1969. Approximately 300 clean-up workers are combing the beaches, scooping up oil- and tar-covered sand. Coast Guard Captain Jennifer Williams told Reuters the clean-up will involve scrubbing soiled rocks and hosing down contaminated areas. Nine ships are assisting in cleaning up the stretch of affected ocean. Three are scooping up oil from the surface, while six are containing the oil slick with booms. Clean-up crews are asking for more buckets, gloves, shovels, water, and volunteers. Fishing and shellfish harvesting in the area has been suspended until further notice. Two popular seaside destinations, Refugio State Beach and El Capitan State Beach, will remain closed to the public during the upcoming Memorial Day holiday weekend.